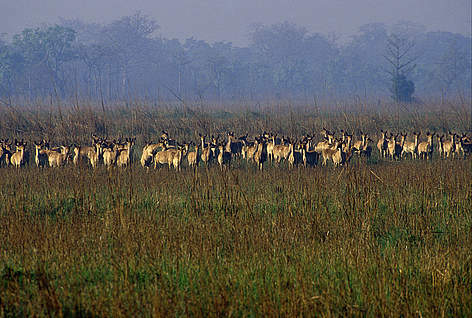 Endangered black buck (Antilope cervicapra) race across their fenced-off protected area, Kharirapur, Royal Bardia National Park, Terai Arc, Nepal. The blackbuck (Antelope cervicapra) is a small gazelle, with a shoulder height of 70 - 80 centimetres. It lives mainly in open grasslands or dry deciduous forests. During the breeding season, blackbucks live in herds comprising an old male and several females and fawns, while younger males stay away avoiding competition with the old ones. During other times of the year, they all gather together to form mixed herds. They are vocal animals that use several kinds of sounds to communicate with each other. Blackbucks can quite easily get habituated to human presence. According to old scripts, it seems it has been quite usual for Hindu fakirs to tame blackbucks and have them as domestic animals, and there are several old paintings depicting kings and other prominent figures together with tame blackbucks. As an animal of open plains, blackbuck has always been easy to shoot. After a long history of hunting and habitat loss, very few blackbucks remain in Nepal. There are a few small populations left, and with long-term measures, they can be brought back to numbers that will be genetically viable in the long run. 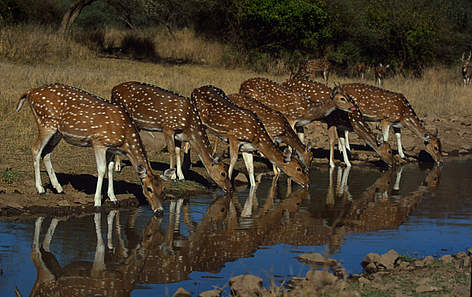 Axis axis Spotted deer Group drinking water . The spotted deer (Axis axis) is a medium-sized, gracile deer living in forests and meadows. It prefers sites with water nearby, and is also an able swimmer. The species is sociable: they are normally seen in groups comprising both males and females, numbering from a dozen to even a hundred. When a spotted deer notices a predator, it gives out an alarm call that sends the whole herd fleeing. Spotted deer can often be seen together with langur monkeys, since the deer benefit from the tree-dwelling langur's capability to see predators from a distance. Males shed their antlers once a year and replace them by growing a new pair, bigger than the previous ones. Despite this, leftover antlers are seldom seen lying around on the ground, since spotted deer (as well as other animals) often gnaw at them until they are completely eaten, in order to consume the valuable nutrients they contain. Spotted deer form a major part of a tiger's diet. Thus a viable tiger population can only exist if there also is a viable population of prey species. Barasingha or Swamp deer (Cervus duvaucelii); Royal Suklaphanta Wildlife Reserve , Terai Arc Landscape, Nepal. The swamp deer (Cervus duvauceli) is a large animal living in open grasslands and marshlands. Swamp deer live in groups that easily merge to form huge herds, even up to 1,000 animals. They depend on open grasslands, as their diet is that of a true grazer, without the occasional twig or piece of bark included in the diet of the other deer species of the Terai. Suklaphanta Wildlife Reserve, in the westernmost part of Terai, is home to the world's largest herd of swamp deer. This protected area is estimated to have approximately 2,500 swamp deer, and sometimes a lucky visitor can see almost all of them at the same time, grazing as a vast mass of light-brown bodies over the plains. Gharial (Gavialis gangeticus), Chitwan National Park, Nepal. The gharial (Gavialis gangeticus) is a peculiar crocodile. The long, very narrow snout gives the species a unique appearance. On top of this, an adult male sports a large bulb on top of the tip of his snout. The gharial spends most of its time submerged in water, but females lay their eggs on sandy riverbanks. Once a female has found a place that pleases her, she digs a hole in the sand, deposits her eggs and covers them carefully with sand. After the eggs have stayed for 3 months in this reasonably even temperature, the young gharials break out of the eggs and emerge from their sandy cradle. Even though an adult gharial may be more than 3 metres long, the species is not interested in humans or other large mammals as prey. Unlike most other crocodiles that are happy to eat any warm-blooded species they can catch between their jaws, adult gharials usually stick to a diet of fish. Occasionally some very large gharials are known to have caught mammals, too. Young gharials eat whatever they can catch with their miniature snouts: insects, frogs, and so on. The gharial is one of the most endangered crocodilian species in the world. Today, less than 2,000 gharials exist in the world, with a few hundred of them in Nepal. Gharials have been hunted, suffered heavily from river pollution and steep declines in fish populations. To top all that - their eggs have also been collected for medical use. To help the gharial population grow, there is a breeding programmein Chitwan National Park. As the gharial is at its most vulnerable state at the beginning of its life - as an egg and as a little hatchling - newly laid eggs are collected from nest sites and brought to the breeding centre, where the young will be raised. When they are big enough to avoid most dangers in their natural habitat, they are released into the wild. The Hanuman langur (Presbytis entellus), also known as the grey or common langur, is at home in a forest canopy. 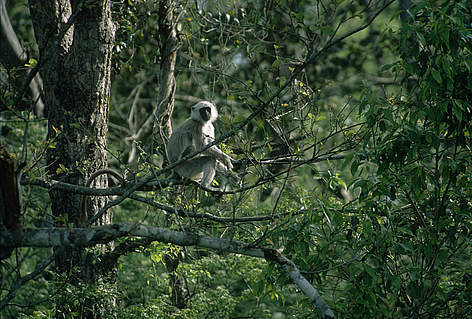 It is more dependent on forests than the rhesus monkey (Macaca mulatta), also a resident of Terai. Some rhesus monkeys have adapted to city life, searching for treats in tourists' handbags, but Hanuman langurs have all remained true forest dwellers. Despite their agility, langurs also spend a lot of time on the ground. Their diet consists of a wide variety of vegetarian stuff like fruit, leaves, shoots, bark and so on. Like other monkeys, the species is active during daytime and sleeps through the night. In the territory of a langur group, there is usually a favourite sleeping tree, where the group returns every evening. Hanuman langurs are reminiscent of humans in several ways, one of them being their social flexibility. Langurs may live in groups comprising several adult males and females, but they are also seen in groups with only one male with several females, while the surplus males form groups of their own. 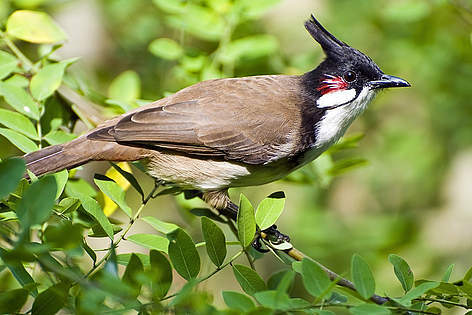 Red whiskered bulbul is commonly found in Nepal. More than 800 species of birds! Nepal has more than 800 species of birds. About half of them live in the Terai. Nowadays, about 15% of the bird species of Nepal are threatened nationally. In most cases, habitat loss is the main cause as two thirds of the threatened species are forest dwelling. Fortunately, there is still a lot left to save. 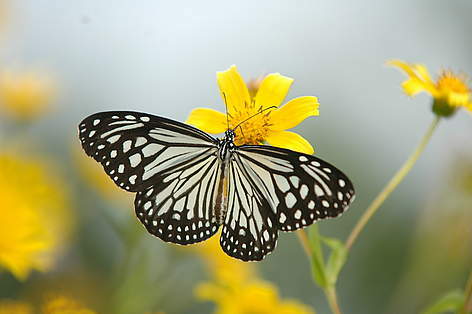 Various large butterflies are a common sight in the Terai. Think conservation and a lot of attention is often drawn to handsome megafauna like tigers and elephants. But nature comprises many smaller species, equally important in maintaining the delicate balance, and if they were to suddenly disappear, the whole ecosystem would collapse. In most terrestrial ecosystems, insects are also the group with most biodiversity. It is quite common in any habitat that the number of insect species found surpasses the number of all other animal and plant species combined. In the lowland parts of Terai, you can sometimes end up in a forest comprising entirely of one tree species, the majestic sal tree. Standing in a sal forest is a completely different experience from the nearby diverse and dense jungles. The tree trunks are long and straight, and there is plenty of light. During spring, while the sal trees are in blossom, the air is filled with a strong, sweet and pleasant smell. Sal is a hardwood species that is unusually resistant to rotting and to attacks of hungry insects. The local saying has it that a sal will grow for a 100 years, then it will fall down, and then it will lay there intact for another hundred. Due to high demand, the species is about to become endangered. Protection measures have now been taken in time, without waiting for the species to end up at the verge of extinction. Thus there is a good reason for optimism: the future generations may well be able to sense the peculiar feeling of being in the middle of a vast sal forest, with sunlight around and the air filled with the sweet smell of spring.